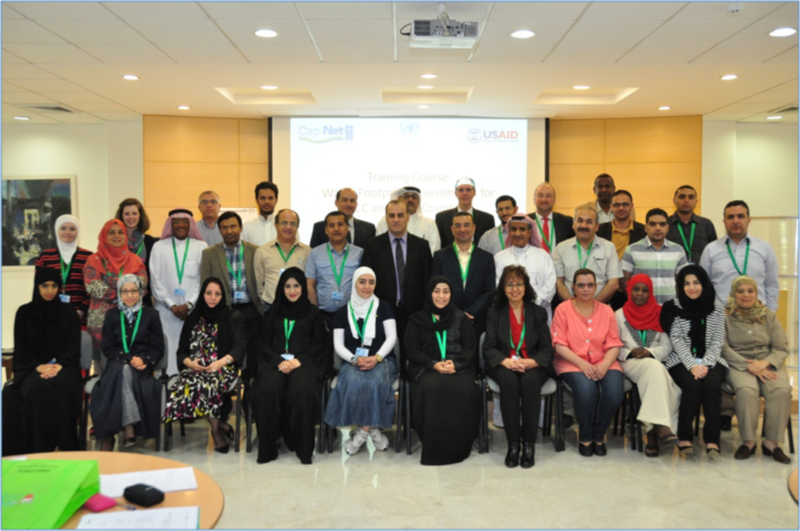 A 1st regional training course on Water Footprint Assessments for GCC and Arab countries was held at the Arabian Gulf University (AGU), Bahrain from 20-22 April 2015. The course was jointly organized and supported by AWARENET, the Arab Integrated Water Resources Management Network, a Cap-Net regional network for capacity development in sustainable water management, the Water, Science & Technology Association (WSTA), the Arabian Gulf University (AGU), the Middle East and North Africa Network of Water Centers of Excellence (MENA NWC), United Nations Economic and Social Commission for Western Asia (UN ESCWA), and Cap-Net UNDP. Over the course of three days more than 30 participants; government officials, researchers and representatives from NGOs from nine GCC and Arab countries successfully participated and developed their capacities on the Water Footprint Assessment concept and methodology. The course covered the Global Water Footprint Standard, experiences in Water Footprint Assessments including accounting, sustainability assessment and formulating response strategies in a variety of settings and cases. It also included technical know-how to implement Water Footprint Assessment in business water strategy and public sector policy and provided hands-on experience for detailed implementation of Water Footprint Assessments. AWARENET is planning to hold further training courses on Water Footprint Assessments and other themes and welcomes regional and national partners to join efforts for further developing the national and regional capacities for sustainable water management. Full report can be downloaded here. For more information, you may contact the following personnel. MENA NWC: Ms. Christel Milazzo, Middle East Activity Manager.